Jesus dolls have been in the news a lot lately. Dawn and I found these in a Manhattan convenience store. I was especially impressed with the Jesus Action Figure's "movable arms and gliding action." There were tiny wheels on the bottom of Jesus' feet, kind of like a pair of Heelys shoes. I guess that would make the Jesus doll a holy roller. The Moses Action Figure came with plastic "stone tablets and a shepherd's staff." The Albert Einstein Action Figure was "dressed for intense classroom action" and was clutching a piece of chalk. 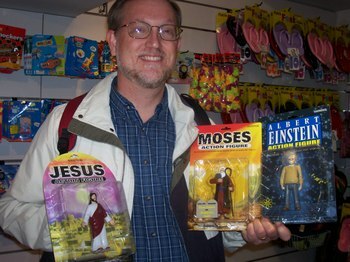 (If I were Albert Einstein, I would be smugly impressed that my Action Figure was being sold right next to Jesus' and Moses' dolls.) Just click on the picture for a more detailed view. Who said it this week: "Opps! We didn't mean to invade." Iran? North Korea? How about Switzerland?!? Here's the latest example of Swiss global imperialism when it "invaded" Liechtenstein! Happy Birthday today to my favorite mother-in-law, Nancy Cox! She probably won't be near the internet today to read this tender note from her positively-the-best-son-in-law, so if you see her, wish her a happy birthday. From the Bible Blog astronomy desk: There will be a total lunar eclipse tonight. Here's the scoop from CNN. Big Stink. The NFL won't let this Indianapolis church use a video projector to show the Super Bowl at its outreach event. What's the big deal?!? Steve McCoy, an unabashed Chicago Bears fan renders this verdict: "My thoughts? You can't love Jesus and the Colts, so either the church is a cult or they are misguided on their choice of football team. Seriously, how about telling the members to invite their lost neighbors into their homes for the game? Or how about going to your lost neighbor's house if they invite you?" Great idea, Steve! Big Rabbits that might solve North Korea's chronic food shortages. How about that humongous hare?!? Washington Post's headline: "Fighting Famine with Flopsies." Big Thought on marriage. Jim Martin writes on "Marriage and Following Jesus." His counsel is a powerful reminder that Christ uses our marriages (if we're married) to make us more like Him. Big, Big Bucks. What the heck do you do with $39.5 BILLION in profits?!? Would someone kindly explain to me why we are still paying over $2.10/gallon for gas? Our daughter, Audrey, recently handed me photographic evidence that conclusively explains why I didn't see Bucky the deer during hunting season. He was with Ms. Doe in Audrey's West Philadelphia neighborhood, paying his respects at the Woodland Cemetery just a few blocks away from her city apartment! 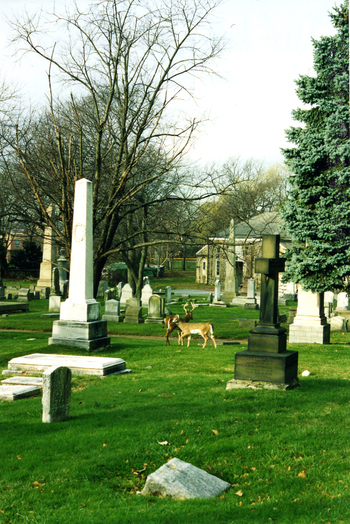 Audrey was there one Monday morning taking photographs when she came upon a group of eight deer grazing amongst the tombstones. What would happen if Santa was Jack Bauer and had one of his days? If you're a fan of 24, you will enjoy this video clip of the Christmas spoof: Santa 24. 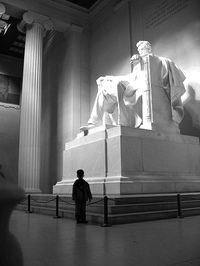 A thoughtful post by Scot McKnight on what it means to be an "evangelical" in America. I have one definition in my head -- a theological one -- but my neighbors probably have a very different one, one that deals with politics and power. Steve McCoy, preacher-photographer extraordinaire, uses his camera like I can only dream of doing: telling a story with his photos. His Christmas scenes from downtown Chicago are truly beautiful. 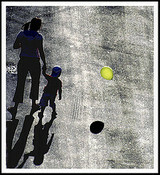 You'll enjoy his photo album posted at Flickr. Are the Mighty Morphin Power Rangers real? Apparently, for a 4-year-old boy thwarted a robbery by dressing up as a Power Ranger and attacking the crook holding his family hostage. The bad guy ran away! How can I communicate better with other people? Justin Taylor summarizes helpful insights for overcoming communication struggles from Paul Tripp. How can I keep a Christ-centered focus during the holiday rush? Pastor Mark Roberts has posted an Advent Calendar that he has written, and it looks to be very thoughtfully done. I'll be stopping by regularly during December to help me remember the true significance of Christmas, and I'll also be sharing it with my family as well. Why should the University of North Carolina no longer be called the "Tarheels" but rather the "Dori-toes"? Look what washed up on the Outer Banks earlier this week.